DePetro.com: Will there be no "Joy" in Raimondo-land? Is Fox on the run? Rumors continue to swirl that Governor Gina Raimondo is set to lower the boom on her controversial, embattled communications director Joy Fox. The Governor is plagued by low approval ratings and mounting frustrations that her message is just not getting out properly to voters. 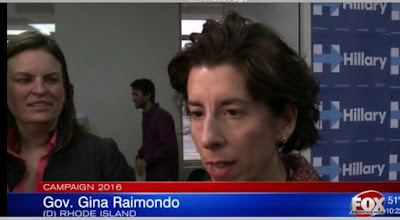 Fox, who is paid over $126,000 a year, seems clearly in over her head and unable to muster any support from the Raimondo faithful. Insiders describe Fox as limited in her ability and unable to manage the communication office. The latest attempt is sending "Queena" on a "listening tour" of Rhode Island , less than 18 months into taking office. "There is a feeling that somebody is getting fired and it has come down to the chief of staff, or Joy Fox," said one Democrat insider. Stay tuned to the John DePetro show for all the details.